I just had a birthday. It was great, even though I could have sworn I was turning 43 – I was told that happened last year. Oops! My kids really don’t understand, and I guess I don’t either. How do you forget how old you are? But I digress. Feel free to say Happy Birthday in the comments section (that would be just lovely! 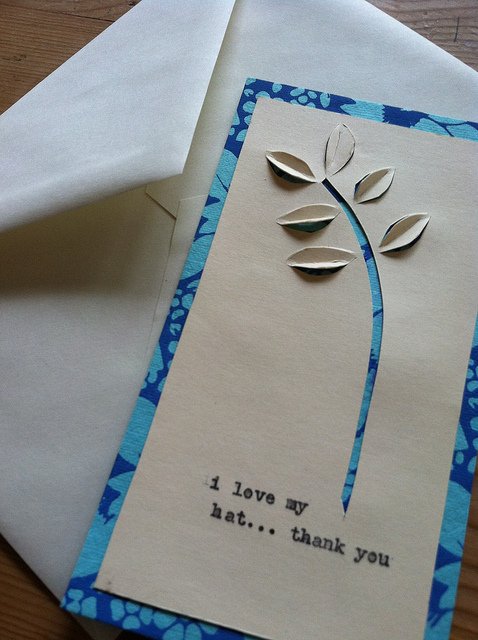 ), but I’m really here to talk about thank you notes. 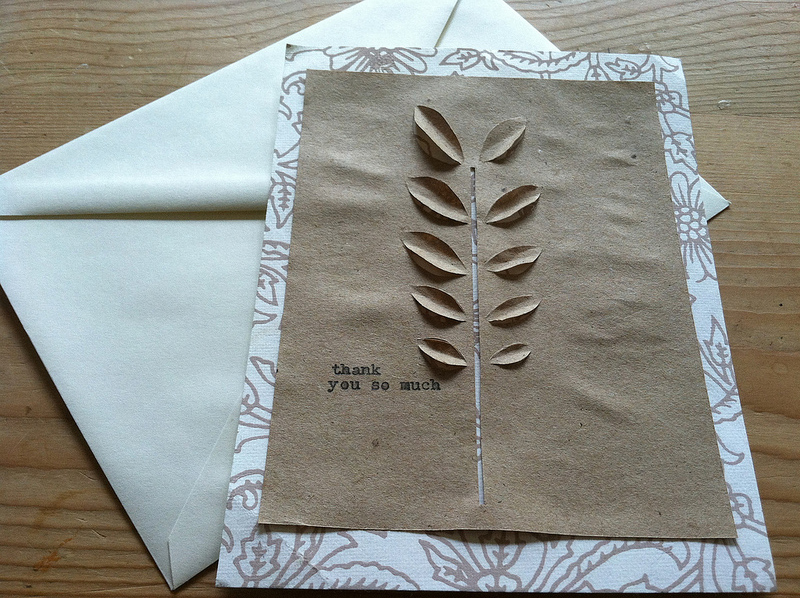 We all know they are important and it doesn’t matter how or what you send to show appreciation for the kindness spent on you, just so long as you do it, but if you have run out of store bought cards and the days are passing and your thank you notes have not been written, then maybe you’ll consider hand making them. It takes less time than going to the store and they are so nice. 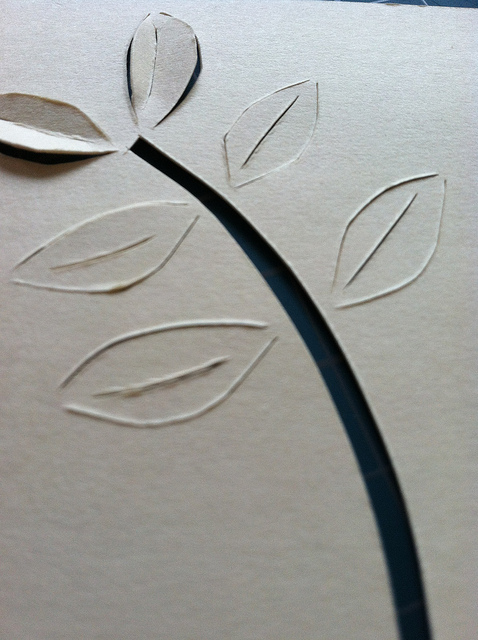 They can be made a million ways, but here is an idea you might like to try – paper cut cards – they’re easy! Promise! 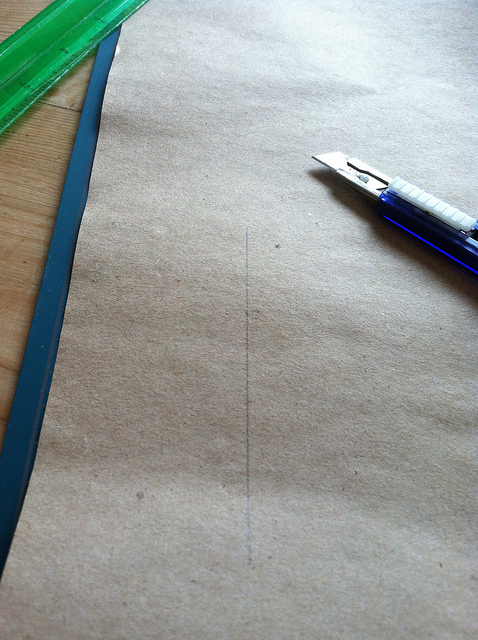 1) Draw a guide line on your paper, if you want to. I drew a stem and the rest I eye balled. 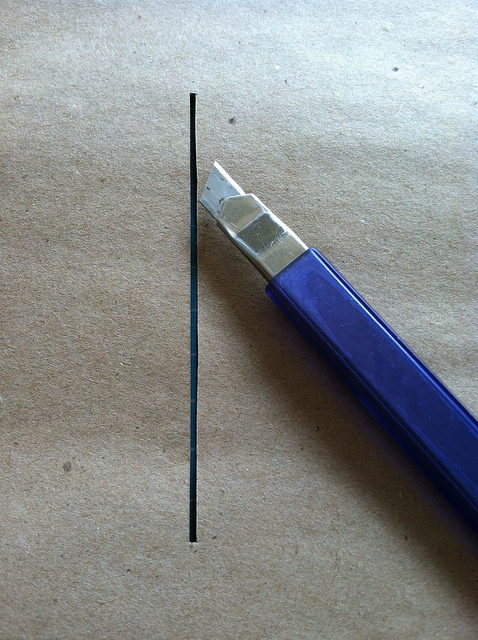 Cut along this line and then parallel to it, cutting at the top and bottom as well to remove strip. 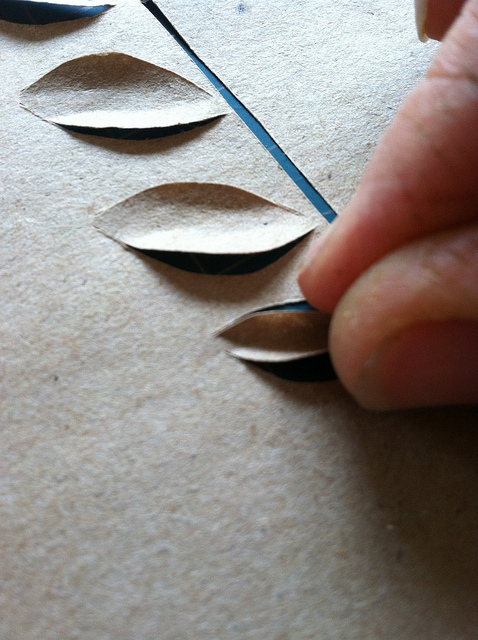 For making the leaves, cut a leaf shape but do not connect them at the top and bottom. 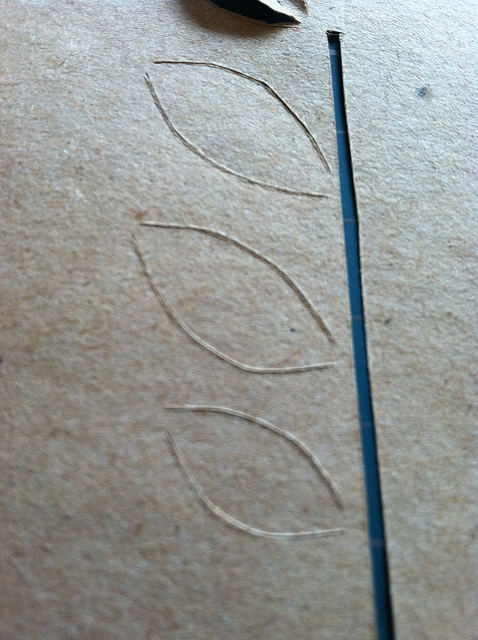 This will allow you to pinch them and fold them towards the front of the paper without removing the shape entirely. 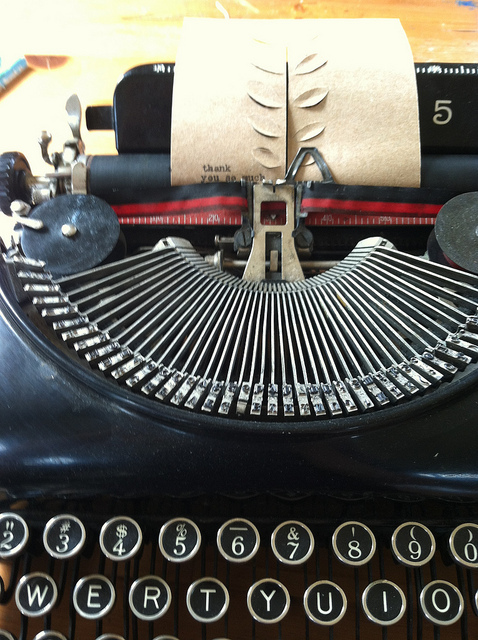 2) When you are done with your design, write your note on the back, or type some words on the front. 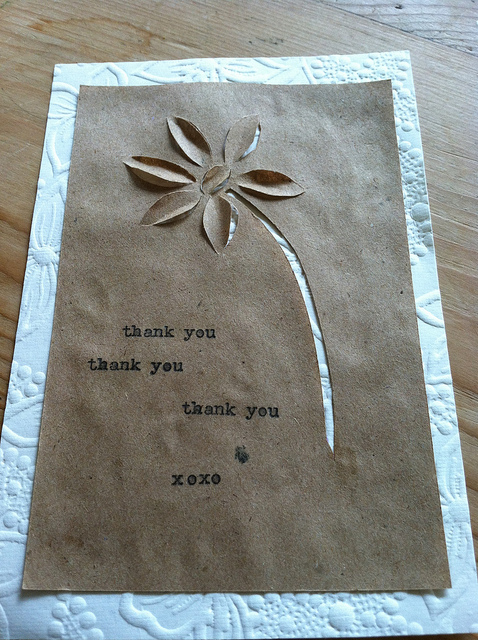 I mounted mine on a decorative paper and also wrote a personal note on the back. You can see that this paper was thin and the glue stick made it bubble a little. In real life it looked totally fine, but with the shadow it showed. Using a thicker paper will help this if it bothers you. When using a thicker paper, I found it was helpful to score where I wanted the paper to fold. Without the scoring, the oak tag creased and looked messy. Tip: When cutting your paper to make a shape, think about how you want the dimensionality to be so you know where not to cut through. If you cut through the whole shape, it will come out. The design possibilities are great and though I stuck to botanicals here, there aren’t any really boundaries if you have the imagination for it. Nicer than an e-card, but it’s the thought that counts!